Posted on 11/8/2013, 8:00 am, by rackycoo, under Home Sweet Home. Here’s a simple way to add color and fun to a plain coffee table using decoupage! 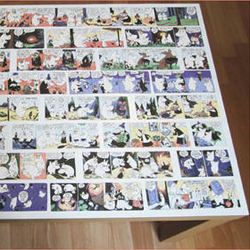 Emu painted the table top white, and then used panels from a Moomin comic to give this once-boring table a one of a kind look. The entire project took less than a day and looks fantastic. You can do it at home this weekend!